Sitting comfortably? Well let us tell you the story of how a little rabbit managed to create so much demand we had to stop PRing him! Back due to popular demand, this spring saw one of the most recognisable children’s literary creations ever return to our 50 pence pieces. 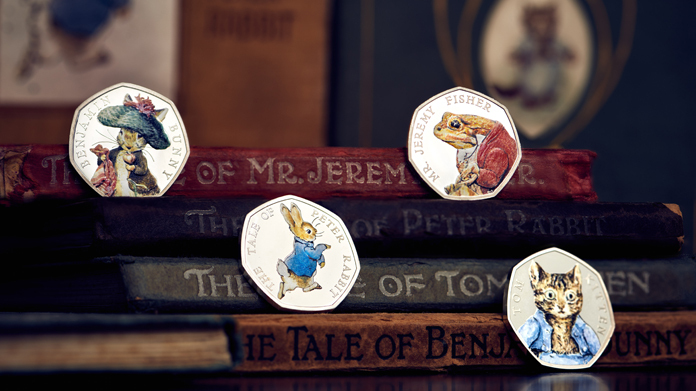 Developed in collaboration with Penguin Random House (publisher of Beatrix Potter’s Tales), Peter Rabbit is joined by Benjamin Bunny, Tom Kitten and Jeremy Fisher on a limited edition range of coins. After spending a day shooting at the Penguin archive with original watercolours of the characters and first edition books, the team revealed the designs to the public. And to say it was well received would be a gross understatement. The news was featured in print across The Times, Daily Star and The I, as well as creating a veritable wall of coverage online including CITY AM, The Sun (three times), Evening Standard, Daily Mirror, Daily Express, Independent, Daily Telegraph, The Times (again) and Daily Mail (twice) along with T.I.M..
Oh and it also featured on Sky News and ITV News. All that amongst a couple of hundred other pieces pretty much everywhere. It’s always great to see how PR impacts the brand, and this sell in was a fantastic example. The coins sold out within ours, with so many people visiting the website that it came close to a crash and we had to stop proactively promoting the little fella – a story we were only too pleased use to help fuel the story.